Most carafe filters rely on gravity to move the water through the filter. After you filled it, you have to wait for several minutes. This one is different. 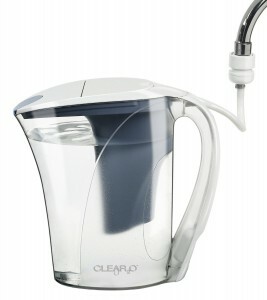 The Clear2o® CWS100AW water filtration jar uses a different approach. Once connected to your faucet the water pressure forces the water through the filter and fills the jar in seconds. Installation is easy. You remove the aerator and screw the included adapter on your faucet. Now the hose can be clicked onto the adapter. In the beginning you should open the tap just a little bit until you get a feeling for the amount of water pressure this device can handle. And little later you have filtered water with great taste and free from cysts, asbestos, mercury, lead and other contaminants. The clear, BPA-free pitcher holds 72-ounces of fluid. A flow meter indicates when it is time to change the filter, so no guesswork here like with some other models that rely on stickers or other reminders you have to set manually. One filter cartridge is good for 88 refills which is equal to 50 gallons. What does the Clear2o® CWS100AW remove? For a complete list of contaminants this water filter can take care of, see the manufacturers data sheet here. Needs a connection to a faucet to work. Does not work with sprayer-type faucets. The pitcher including one filter cartridge, hose washers and adapter has a list price of $33. At the time of writing, Amazon offered a discount. A replacement filter costs $9.99.